Yesterday, the Charles Koch Institute hosted a panel discussion on the cost of government cronyism – and the numbers were truly astonishing. Today, through government cronyism some 60% of American financial liabilities have some form of government guarantee behind them; half of all Ex-Im Bank loans go to foreign airlines and 20% go to foreign oil and gas interests. The Rayburn House Office Building’s historic Gold Room was packed with congressional staffers and journalists who came to hear presentations from economist Veronique de Rugy, The Washington Examiner’s Timothy P. Carney, author of The Big Ripoff: How Big Business and Big Government Steal Your Money, and Diane Katz, Senior Research Fellow in Regulatory Policy at the Heritage Foundation. 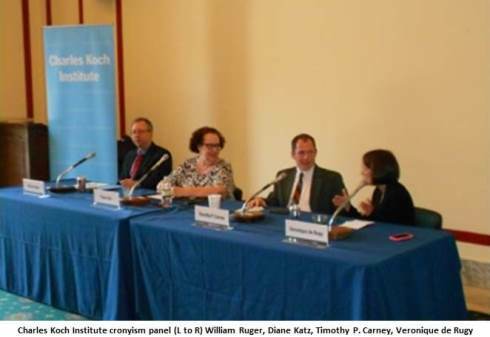 The program was moderated by William Ruger, Vice President of Research & Policy at the Charles Koch Institute. The consensus or “top takeaways” of the panel was that taxpayers have no idea what government cronyism really costs them, how pervasive it is and how it distorts the economy by using politics and political connections, instead of free markets, to pick winners and losers. de Rugy defined it as “the unhealthy marriage between government and business,” including any favor granted by government to business, noting that it is not just Big Business, but small businesses that benefit from cronyism. The Small Business Administration (SBA) is rife with cronyism in this formulation. Carney distinguished cronyism from “merely bad policy” by defining it as any active government intervention that benefits a class or individual company. But in Carney’s view industry’s failure to oppose the law was more about the fact that their margins on the old fashioned light bulbs were so narrow that the opportunity cost compared to making more expensive new technology light bulbs was a losing proposition. By legislating themselves out of one line of business they raised their margin as workers and consumers faced the consequences of job loss and higher costs. Diane Katz cited the Farm Bill and the IRS tax code as the two greatest examples of cronyism. Although they contain almost no direct payments they are rife with special favorable treatment, protection and carve-outs that raise prices for consumers and grant government favors to special interests. de Rugy said the idea that “no one in the private sector will lend you money, but the government is here for you” distorts the economy and drives private capital away from innovation and toward the government favored business. This concentrates benefits on a small group of well-connected businesses growing government and in the process reducing competition. If you care about consumers and workers you oppose loan guarantees said de Rugy. The notion of “political distortion” of markets was a major focus of the panel. Caney noted that the distortion of loan guarantees and other benefits of cronyism were largely invisible; welfare was a direct payment and thus easily quantified and opposed, whereas cronyism’s benefits to its beneficiaries were often much more subtle. Diane Katz identified these invisible benefits as “political distortion” and noted that such political distortion results in concentrated power which attempts to keep and expand government so it can derive more crony benefits. Citing tech guru Elon Musk’s Space X as an example Katz noted that no other private space launch company can compete against Space X because of its government subsidies, thus instead of encouraging innovation the government has, based on politics not the market, picked a winner in the private space launch industry. In de Rugy’s analysis the ideal that Americans used to have and should strive for again is “permissionless innovation” driven by markets, not by government policy. In conclusion the panel was asked what could be done to reduce or eliminate crony government. Diane Katz said it was her conclusion that cronyism had gotten so bad that it could no longer be ignored and that the fight to end the Ex-Im Bank was a winnable fight that put ending cronyism on the front page. She cited telephony and airline deregulation as two other areas where cronyism was rolled-back and the world did not fall apart. Timothy P. Carney cited more micro examples, saying the rise of UBER competition to taxis and food truck competition to restaurants were two examples of the free market at work that were making consumers more aware of how free markets help them and thus creating political support for the idea that consumer welfare was much better where markets were free. In her conclusion Veronique de Rugy was somewhat less sanguine, noting that sometimes where cronyism is rolled back a new form of it arises. Citing the example of the SBA she said in the 1980s there was a concentrated effort to do away with direct government small business lending, but the result was not an end to cronyism, but a new form of it, in that case loan guarantees as opposed to direct benefits.